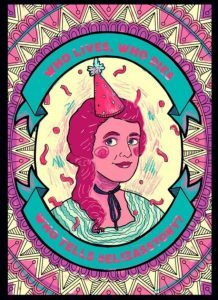 Happy Birthday Eliza Hamilton – We’ll Tell Your Story! Eliza Hamilton turns 261 on August 9th, 2018. And, to celebrate her birthday and her legacy, Coloring Broadway teamed up with Graham Windham to create a special coloring page! Eliza, the Founder and First Directress, was born on August 9, 1757. Just 48 years later, Graham Windham came into being as The Orphan Asylum Society in New York City. Eliza began and her legacy that lives on in the critical work Graham Windham does to support kids and families in NYC. Today, we celebrate and honor her incredible contribution to our nation — building a strong foundation for some of our country’s most vulnerable children. 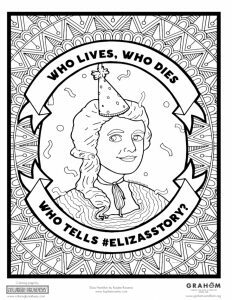 How can YOU get the Eliza’s Story Coloring Page? There are two ways! Join us on Wednesday, August 8th, from 12pm-3pm, at the “Coloring with the Strand” event, sponsored by the Times Square Allianceand The Strand Bookstore. We’ll be located on the Broadway Plaza between 43rd and 44th Street. Times Square visitors can take a seat, relax and add their creativity to a commemorative coloring page celebrating Eliza Hamilton. Can’t make it to Times Square on Wednesday? You can download your own copy of the illustration here. 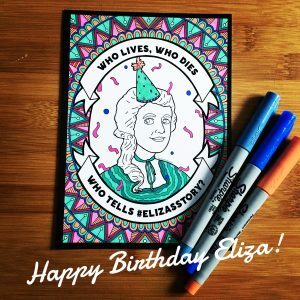 (http://bit.ly/ElizasBirthday) Then grab your favorite things to color with and put on your Hamilton cast album and get coloring! However you get your coloring page … Help us celebrate Eliza and all she did by sharing your coloring! Use #ElizasStory and by tag us on Instagram (@grahamwindham and @coloringbroadway). Thanks so much for being a member of our community and for helping share Eliza’s Story! This illustration is the combination of a fabulous piece of fan art from Kaylee Rowena and the illustrating powers of Justine Fisher! ← Mamma Mia Movie … Here we go again!